Fifth grade is a year of transition from elementary school to middle school. Fifth graders start growing toward independence, but still need guidance, support and encouragement from home. We assist parents in the spiritual, educational and social development of their child as they prepare for the middle school adventure. Fifth-grade religion is taught from the book, Christ Our Life; We Worship published by Loyola Press. It provides Catholic elementary school children with age-appropriate information about teachings of the Church and a clear vision of the Gospel. Emphasis is placed on discipleship. We show Jesus that we love and respect the awesome gift of His true presence in the Eucharist as we participate in Eucharistic Adoration once a week. The curriculum includes attending weekly Mass with fifth graders having the opportunity to participate as readers and ushers and later as altar servers and cantors. Prayer, both formal and informal, is used daily in the classroom. The last unit of the religion program is from Benziger’s Family Life series. This family life program helps fifth graders prepare for adolescence. 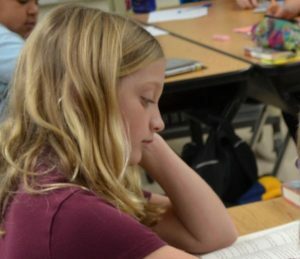 The fifth-grade language arts curriculum consists of three components: reading, writing and grammar. The exploration of novels and trade books using the comprehension strand of Project Read, provide opportunities for students to grow in their understanding and/or mastery of reading skills, literary elements and devices and various literature genres. Students will have the opportunity to participate in the Accelerated Reader program, Literature Circles, Guided Reading and Independent Reading. Houghton Mifflin English provides the structure behind our grammar program. Students are exposed to and practice the use of grammar, mechanics and other English usage conventions. They are provided with daily opportunities for incorporating these concepts and skills into their writing, as well. Writing will be taught using Write Source textbooks. The writing process and six traits of writing will be emphasized. By fifth grade, students should have developed a sense of when something may not be spelled correctly. Students are encouraged to proofread their work, consult dictionaries or glossaries and use spell check on computers. Learning the meanings of Latin and Greek roots and suffixes is valuable for spelling and writing and even more valuable for vocabulary development and reading. Fifth graders are assigned a spelling unit in the Zaner-Bloser series to complete each week, followed by a pretest and a final spelling test. Our vocabulary books are from the Sadlier Vocabulary Workshop Series. We alternate weekly with our spelling and vocabulary text books. They will be asked to learn definitions and will be tested on them. Students are encouraged to use cursive writing and some drill is necessary to ensure basic fundamentals, as communication depends on legible handwriting. Students’ inability to communicate legibly puts them at a disadvantage. Unreadable academic assignments, even though they may be accurate, often result in poor grades. Students feel more confident if their work is neat and easy to read. The purpose of the fifth-grade social studies curriculum is to provide students with a survey of major events and personalities of the United States, from the arrival of the earliest inhabitants through the development of the Constitution. Our text book by Harcourt School Publishers; The United States series is supplemented with worksheets, projects, vocabulary, and other activities. Students study the earliest inhabitants of America and are reminded of the different cultures that have helped shape life in the United States. Focus continues on colonial life and the role of our founding fathers and mothers, as events lead into the American Revolution. Fifth graders concentrate on the use of various reference materials that are available in the school’s Media Center. They use atlases, encyclopedias, almanacs and the Internet as sources of information. Students use search engines effectively and are able to explain how they work. Fifth graders can explain why the Newberry Medal appears on certain books. They learn how to distinguish fact, point of view and opinion and they become more aware of how the media shapes attitudes and values. Students develop personal reading, viewing and listening preferences. They also learn about individual property rights, as it pertains to information created by others. Fifth graders follow the curriculum, Science; A Closer Look, by Macmillan/Mc/Graw-Hill. This series is divided into three main units; Life, Earth and Physical Science. The life science unit is divided into two major components; Diversity of Life and Ecosystems. Life topics range from cells, classifying plants and animals, plant and animal life cycles, traits and heredity. Animal adaptations, energy flow, biomes and animal survival are also studied. The earth science unit discusses Earth’s landforms. Space units discuss our atmosphere, the earth, moon, solar system and stars. The physical science units discuss the properties of matter, elements and physical and chemical changes. The forces of motion, simple machines and the five types of energy; heat, sound, light, electricity and magnetism are considered. There are many exciting hands-on projects and experiments done in class and lab time. Science lab (in our sophisticated science lab) is scheduled weekly to help develop a better understanding of material presented in the classroom. Students will use the scientific methods to hypothesize, observe and interpret data. Conclusions will be drawn and analyzed. These methods will be further explored in the development of the students’ Science Fair writing project. My Math 5, by Macmillan McGraw-Hill Publishers covers a variety of math concepts. We will review and increase students’ depth of knowledge of operations with whole numbers, metric and standard measurement, classifying geometric figures, graphs and interpreting data and Algebraic equations. Students will also develop skills in decimal and fraction operations. Skill practice is available through online games, worksheets and practice tests. The text is also available online for further home study. Information will be supplemented with hands-on learning using manipulative blocks and materials. Multiplication facts must be practiced and mastered at this grade level. Daily work, participation and assessment will be given throughout each topic and daily home practice is expected. We offer an online math program called ALEK to enrich our math curriculum. This program has fact practice and concept practice that enables the student to develop skill knowledge. This technology-based curriculum will be integrated in the classroom for all students to work at their own level on mastering concepts and enable them to advance to more challenging levels. The focus of the elementary music curriculum is on making music. The musical concepts of melody, rhythm, harmony, form, style/expression and timbre/texture are taught in a cumulative fashion through experiences of listening, singing, playing instruments, moving, creating and reading/writing. Elementary choir is provided for those students interested in choral music. This group is composed of third- through fifth-grade students and meets once a week during recess. The choir studies singing in parts and good vocal techniques. It performs in the Christmas concert, leads the all-school Masses and sings for the community throughout the year. Interested 5th grade students are trained to be cantors and lead the music during mass. Good vocal technique and a deeper understanding of music in liturgy is part of this training. Grades three through five are dedicated to the development of a variety of manipulative skills that reflect a refined mastery of ball handling skills, as well as development of a variety of perceptual motor skills. The teaching at this level will focus on the value of being physically fit and the ability to display appropriate behavior during social situations. Grades four and five further develop their skills in both two-dimensional and three-dimensional art. The focus is on refining and further developing the art concepts introduced in the primary grades (cutting, shape recognition, drawing, color wheel, painting, paper construction and clay construction). In addition, there is an introduction to more complex print-making methods. The study of artwork from different cultures and various artists is continued and expanded through these years. Students in fifth grade will participate in beginning band class twice a week for 30 minutes. Instruction is offered in small, “like” instrument classes. Students may choose from flute, clarinet, saxophone, trumpet, trombone, baritone and percussion. The classes focus on reading music, learning the basics of their instrument, playing in an ensemble and preparing for three performances. The first performance is the school Christmas Program. Band continues in the sixth grade as part of the school curriculum. Students continue to work on their keyboarding skills and use techniques found in Hyperstudio and Microsoft PowerPoint. They are able to create full-page reports with multiple paragraphs, including a title using Microsoft Word. They learn to master the editing toolbar, menus and numerous keyboard commands. Students are able to use a flatbed scanner to digitize images and insert them into reports and/or presentations. Their introduction to spreadsheets enables them to input, manipulate and graph data using Microsoft Excel. Students continue to use the Internet to research information and explore and integrate interactive websites with current curriculum. They use Netscape Composer to create web pages to display their schoolwork. Fair Use and Copyright guidelines are discussed and reviewed in regards to downloading and using Internet graphics. Spanish class students will become acquainted with the Spanish language through fun, entertaining activities with puppets, music, picture cards, stories, skits, projects and vocabulary games. Learning about countries and cultures of Latin America and Spain is also part of the Spanish program. Fifth grade will become acquainted with the Spanish language through cross-cultural explorations, as well as interactive and fun activities that include music, stories, projects, skits and games. The vocabulary will increase in order to achieve a higher level of comprehension and conversation. Grammatical concepts are introduced and practiced through conversation and fun activities and games. Beginning reading and writing continues with more emphasis at this time. Hispanic Catholic faith and culture is presented with short prayers, songs and traditions. Keyboarding: Keyboarding class is taught weekly during the school year to fifth grade. Students are encouraged to use these skills on assignments. Fifth-Grade Camp: This is a fun-filled three days with emphasis on environmental education, which takes place at the YMCA Storer Camp outside Jackson, Michigan. Field Trips: Our class field trips vary from year to year. In the past we have seen plays, visited museums and participated in lessons taught at St. Joseph Hospital. T.E.A.M. : Washtenaw Sheriff’s Department personnel teach our students how to recognize and resist direct and subtle pressures that may influence them negatively. Ready, Set, Let’s Go to Fifth Grade! At school, fifth graders are expected to practice greater responsiblity. Children are expected to listen attentively and to follow both oral and written instructions. Students learn to use their study time wisely to complete assignments by due dates. Children need to take good care of belongings and supplies. Classroom procedures require listening during instruction with independent follow-through. On the average, fifth graders should plan on 50 to 60 minutes of homework per night. Some assignments may be long-term projects like book reports, spelling lessons and the like. These assignments should be worked on during evenings when there is less daily homework or on the weekend if your child works at a slower pace or has many outside obligations during the school week. All assignments should be recorded in an assignment notebook and handed in on time. Getting and staying organized is a life strategy practiced in fifth grade.